Congratulations to the "BACHs" who won Season 5 of Jack Attack. Click the results icon to see the final ladder. The next season starts on Wednesday 23rd October 2019 and will run for eight weeks. We guarantee that you will have lots of fun and enjoy the friendly competition. 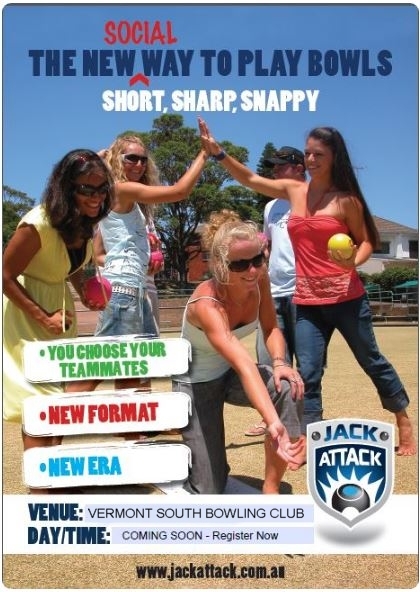 The Vermont South Jack Attack Challenge is a team bowls competition designed for people interested in playing bowls but not ready to commit to membership of a bowls club. Its fast, its fun and its social. The competition runs over six consecutive Wednesday nights. All matches commence at 6:00pm and conclude around 7:45pm. The games move quickly. Our green will be open from 5pm so that teams may practice before the game. Our Club bar will also be open from 5pm. Each team is made up of three players. Substitute players can be used either on the night or from week to week. We provide ALL the equipment or you can bring your own bowls. Footwear needs to be thongs or flat soled shoes but you can play in bare feet if you wish. Each week there will be prizes for the winning team. At seasons end the team on top of the ladder will receive $240 and the runner up $120. Match results and season ladders will be published on our website each week. Your registration for the season is $30 per team. Each evening of competition costs $5 per player ($15 per team). Simply fill in this enquiry form and we will take it from there. Alternatively, contact John Temple on 0429 836 752 or email j.temple.au@gmail.com to register interest or to ask questions. We look forward to you joining us at Vermont South to kick off this fast and fun version of competition bowls. Teams may register more than 3 players to accommodate for substitutes, absentees and/or busy working lives). Substitutions are permitted during a match after the completion of an end. Game format is two-bowl triples, two sets of five ends. The winning team of the previous end places the mat and the jack (minimum 21m from mat) and must play the first bowl. A coin toss determines which team leads off in the the first end. Teams must play alternate bowls but playing sequence within a team can be varied. 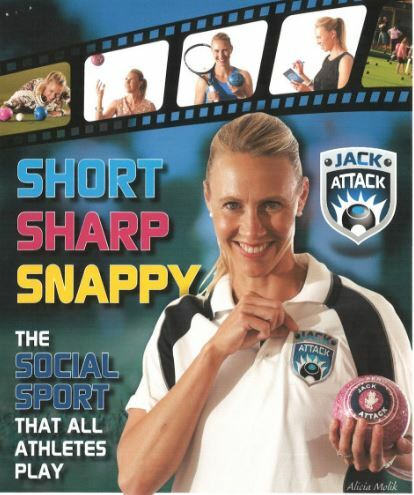 All players are encouraged to remain at the mat end to ensure the social atmosphere is maintained, i.e. no "skips" at the head. Each team can have one power-play per set. A power-play is where the score is doubled for that end. This is to be nominated before the first bowl for that end. A bowl that touches the jack and ends up in the ditch within the rink boundaries is still in play. Jack moved into the ditch within the rink boundaries is still in play. Jack out of play is re-spotted to the ‘T’. A one-end sudden death tie breaker set is played if scores are level at one set all. Coin toss to start tie-breaker. Scoring on each end is according to the usual bowls method where shots for closest bowls are worth 1 point. Match Points (max. of 6 points) are earned each week. 2 Points: Per Set Won (not including tie-breaker set). The Season winner of shall be the team with the highest points score after the final round of matches. Should teams finish on equal points, the team that scored the higher shot percentage over the entire season shall be declared the winner. Result of any dispute is declared by the Vermont South Club Bowls coordinator/facilitator.